Beverly here for my day! Well, this Hurricane Irma has me all mixed up down here in Orlando, FL!! I don't know what day it is! LOL!! Have had it good with electricity, wifi, and less damage than other hurricanes!! Am feeling so blessed! And so here is my card using the wonderful Kennedy Grace Creations Grace's Little Note stamp set colored with my Copic markers. Made it simple. 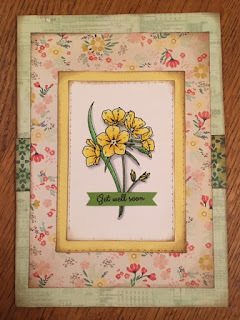 Also stamped the sentiment onto green cardstock to lay over the flowers. Trimmed and adhered. 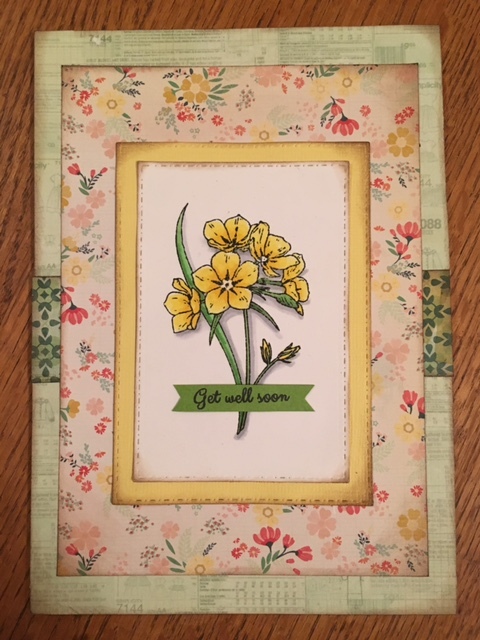 Other supplies: Crate Paper Close Knit 6x6 pad which has a vintage feel; Memento Tuxedo Black ink; Colorbox Roan Brown with dabber for distressing edges of papers; Fiskars 12 inch straight cutter and scissors; Bazzill yellow to match; Strathmore premade card base; Scotch 3L tape runner. Hope you enjoy your day and I will get back to my yard work! The bigger the trees and yard, the more to pick up!! All family members in Florida are fairing well and no houses demolished. Feeling very blessed! Such a beautiful card!! Glad you and your family are ok! !